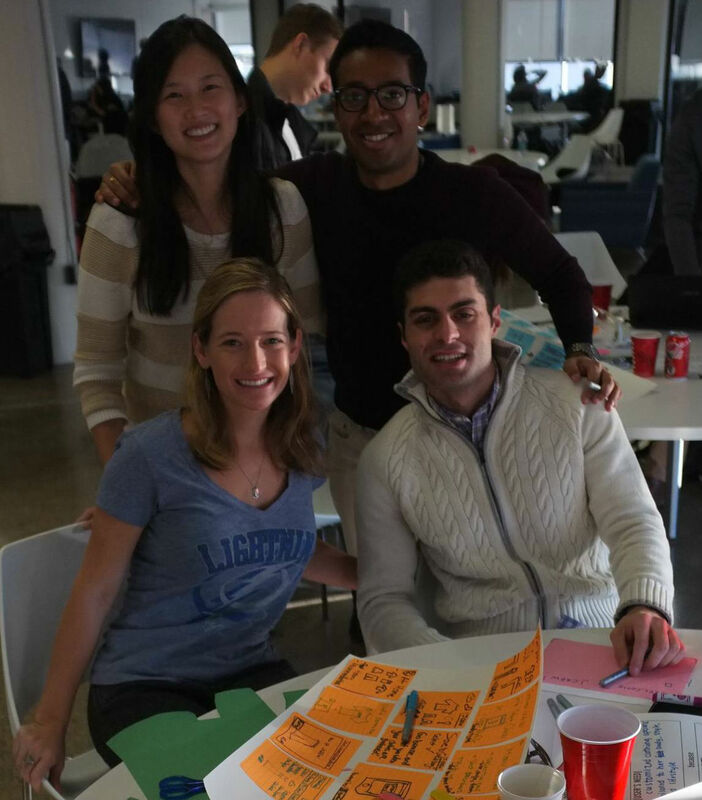 This past weekend several of Wharton’s tech/design/entrepreneurship clubs organized a day-long design thinking workshop and competitive hackathon, the very first Wharton ProductHack. For those of you unfamiliar with the term, a hackathon is not a coordinated group effort to break into banks and foreign government systems – it’s an event where software programmers, product managers, and interface designers collaborate intensively on software products. The first “Hackathon” took place in 1999 when developers were challenged to write new software for the Palm phone (remember those?) in the Java coding language. Hackathons have produced some pretty cool products: the group messaging platform GroupMe was born at the TechCrunch Disrupt 2010 Hackathon, and within one year was purchased by Skype for $85 million. Fintech (Financial Technology) & Payments: How can we help people save more? 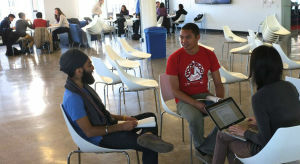 How can we help companies monetize social media? How can we make wireless payments more accessible? Retail IT & Customer Analytics: Have we peaked at the point of sale? How can we help companies get to know their customers? How do you track and quantify word of mouth marketing? Healthcare IT & Connected Health: How will we manage an aging population? How can we deliver better healthcare at home? How can we better monitor our health? 1. Empathize – How do I approach the challenge? 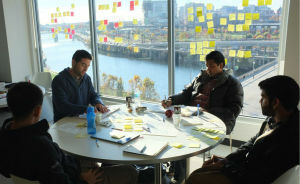 The “empathize” phase sets the foundation for the human-centric design process. It requires you to observe, immerse, and engage yourself with the people for whom you’re designing so you can build a solid foundation for your ideas. How do you expect to build a product for babies if you’ve never interacted with or observed one? By empathizing, you discover needs people have, whether they’re aware of them or not. This stage guides your innovation efforts, identifies the right users to design for, and discovers the emotions that guide behaviors. 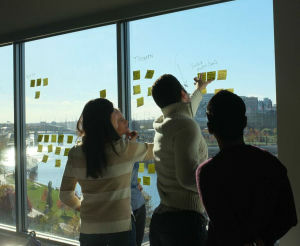 Once we chose our category from the three offered, we set off into the empathize phase by reviewing the challenge, defining our audience, building our question guide, and interviewing our users. The interview process is the most important part of the empathize phase! If you’re designing a new dog collar, talk to all the dog owners you can find; when designing high heels, speak with well-heeled fashionistas; when designing gardening tools, observe avid agriculturalists. By encouraging storytelling and asking neutral questions, you and your team can unlock user experiences that will be critical for your product development. 2. Define – How do I interpret my findings? The “define” phase leads you to better understand your users and come up with an actionable problem statement. Based on insights from the “empathize” phase, you can reframe the challenge you’re trying to address with a “point of view”. A good POV gives focus, inspires your team, provides a reference for evaluating competing ideas, and guides your innovation efforts. At the end of this phase, you should be able to clearly define one recognizable type of consumer. We began the “define” phase by taking turns discussing the info we had gathered. Our teammates listened while writing down onto Post-It notes the words, actions, thoughts, and feelings that came up most often during the interviews. 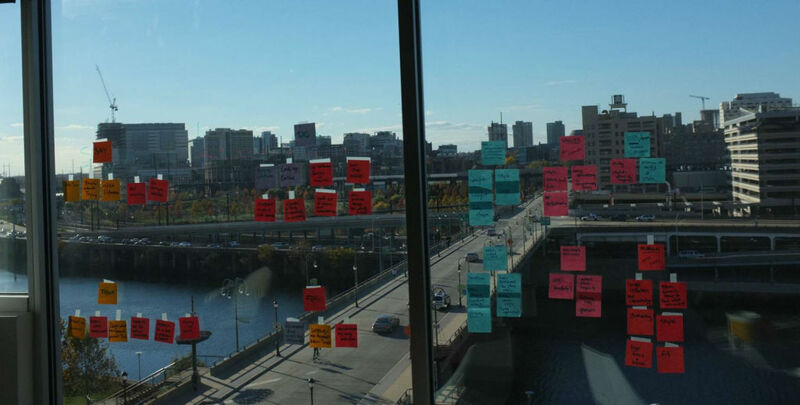 These notes were placed on the wall to create one giant, colorful “Empathy Map” where it was easy to see trends in user feedback and identify areas of greater need. These insights drove the development for our POV and clear direction going forward: [USER] needs to [USER’S NEED] because [SURPRISING INSIGHT]. One team’s consumer and POV: [Hospital staff in charge of allocating ER patients to transfer hospitals] who need [a solution] because [they can’t effectively locate nearby hospitals with available beds and specialty doctors]. They ended up developing a scheduling and routing software that helps reduce wait time for ER transfer patients and improves efficiency in the transfer process. Once you’ve identified this POV, the hard part is over! Now you just have to come up with a solution…. 3. Ideate – What do we create? Now that you have your POV and customer, it’s time to “ideate” and explore a wide solution space – both a large quantity of ideas and diversity among those ideas. This way, you can translate identified problems into a multitude of potential solutions for your users. In order to give everyone time to come up with their own ideas, it’s best to “ideate” individually first and then share with the wider group. I find it helpful to come up with as many crazy, “out there” ideas as possible in this phase – you can always bring them back down to earth later on! Useful methods to spice up the ideation phase: what would be the worst way to solve this problem? How would an alien or superhero solve this problem? Once all the ideas have been presented, you can group them by similarities, discuss pro’s and con’s, and build on each other’s ideas. Make sure to defer judgment, be visual, ask stupid questions, and encourage wild ideas. Throughout this process, one clear frontrunner tends to emerge, and you’re ready to turn that idea into a reality! 4. Prototype – How do I build my idea? 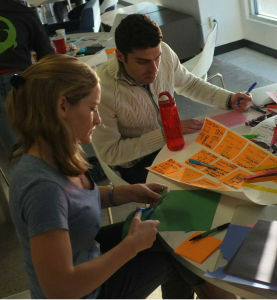 Prototyping is where you take your abstract idea and bring it into the physical world. Whether it’s software, hardware, or something in between, a prototype serves to test the functionality and give feedback on how to iterate. And if you fail, you can fail quickly and cheaply! Make sure you know what it is that you’re testing – is it the implementation of the product? the look and feel? the user benefit? 5. Test – How do I prove and improve the idea? The final stage of the design thinking process is one that never ends – a company that ceases to respond to user feedback and innovate will inevitably fall to its more savvy competitors (Myspace and Facebook, AirBnb and all hotels ever, digital media and the newspaper industry, etc). Use this feedback to test your POV, learn more about your users, and refine your prototype. Over. And over. And over. Document all feedback you get from your consumers: the likes, the questions, the constructive criticism, the new ideas… your next pivot could be inspired from someone outside your company! Design thinking is a great refresher for entrepreneurs, product managers, or anyone hoping to come up with that next big product. 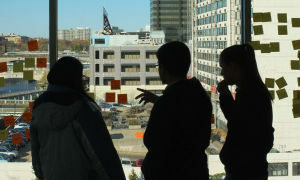 How will design thinking change the way you view the world? **A huge thank you to the following Wharton and UPenn clubs for making this day possible! 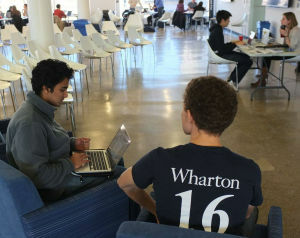 Wharton Tech Club, Wharton eClub, Wharton Design + Innovation, Wharton FinTech, Dining Philosophers, Weiss Tech House, and Wharton Undergraduate Entrepreneurship Club.